Day of the Dead (Día de los Muertos) in the City of Oaxaca is one of the most exhilarating and interesting festivals anywhere in the world. While it’s difficult to miss out on any of the major “muertos” activities without pre – planning, most travelers to Oaxaca for Day of the Dead want advance advice and assurances, rather than wait until their arrival in the city. Once you have your accommodations, and have selected a couple daytime tours in advance, all you’ll need is this primer to know what’s in store for you, and when; whether cemeteries, comparsas, altars or tapetes. The main downtown Oaxaca cemetery to visit during Day of the Dead is the Panteón Municipal or Panteón de San Miguel, located near the east end of downtown, walkable from most lodgings. For this cemetery, both daytime and nighttime st experiences are equally impressive, from October 31 through nd November 2 . Of the village and suburban cemeteries, three stand out. The most popular for tourists is at Xoxocotlán, a 20 minute drive st from the city. It’s traditionally visited on October 31 , from just after dusk until well into the early hours of the next day. As with other cemeteries, though not a requirement many visitors bring a small bouquet of flowers to place on a selected grave. On the same night, but beginning much later (I tend to go after 11 p.m.), there’s the cemetery in the town of Atzompa, also a short drive from Oaxaca. It’s a quainter experience. The pilot for the Festquest television series, and part of the feature documentary Acquainted with the Night, were filmed in these two cemeteries, respectively. 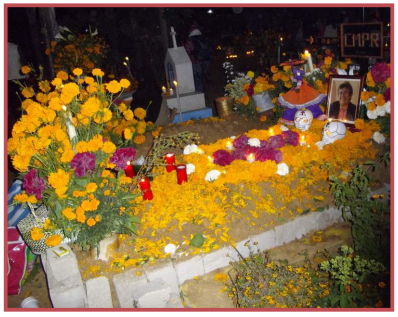 On November 2 , the cemetery at San Felipe del Agua is the place to be, beginning anytime after dusk, although Oaxacans are still bringing flowers to decorate graves well after 9 p.m. Whereas at the two first mentioned cemeteries the municipalities pay for live music, at San Felipe music is heard from small bands, marimbas and groups of guitar strumming troubadours, all hired by particular families. San Felipe is about 15 minutes from downtown. Photographing is both permissible and expected at the cemeteries, but it’s always prudent to request permission at gravesites. Visiting cemeteries, participating in comparsas and searching out the most elaborate and thought – provoking tapetes and altars are but a few of the innumerable Day of the Dead activities available to tourists. A visit to Oaxaca which st includes October 31 and the first two days of November inevitably results in memories lasting a lifetime. Residents are extremely generous with their time, and offer their beliefs, feelings and interpretations of the significance of Day of the Dead. Don’t be shy. Learn how Día de los Muertos in Oaxaca represents a fascinating fusion of indigenous Zapotec tradition and Catholic religious belief, not to be missed; but book accommodations early so you won’t be disappointed. Alvin Starkman and his wife Arlene operate Casa Machaya Oaxaca Bed & Breakfast (http://www.casamachaya.com/ ). Alvin is a contributing writer for Mexico Today. Alvin often takes visitors to Oaxaca out into the central valleys to enjoy the sights, including craft villages, natural wonders, pre-Hispanic ruins, as well as for more off-the-beaten-track experiences.